Inner Corner: This is the area where a colour lighter than your skin tone is generally placed. The texture could me matte or shimmery. People who have close set eyes should strictly follow using a light colour in the inner corner as this would make them seem apart. Mid Lid: For an easy application, use one colour all the way across. You can also use a light colour on the inner half of your lid and a darker colour on the outer half. This will add dimension to your eyes and can make them appear larger. Outer corner or Outer Lid or Outer ‘V’: When applying color here, you’ll start at the outer corner of your eye and create a V up and into your crease. Applying a dark eye shadow to your outer V creates a smokey eye and adds depth to that area. Crease: If you look down into a mirror while keeping your head straight, your crease is the indentation right above your lid. Applying color here adds dimension to the overall look you’re going for. 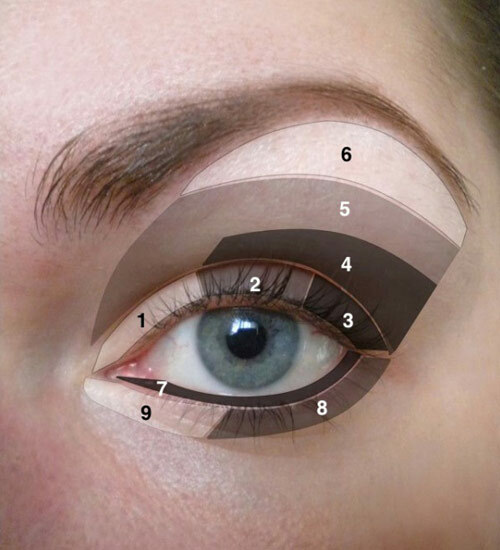 Lower Brow bone: Directly above your crease is your brow bone. Any colour can be used here but I prefer to use one that is closest to the colour of my skin tone. This allows your brow highlight to pop and your crease colours to blend better. Any eye shadow applied on the lid, crease and brow bone should look like a gradation of colour. To achieve this you should blend with a fluffy dome shaped brush. Brow bone or Highlight Area: Your brow bone highlight should be applied just below your brow. You can use any light-coloured eyeshadow, preferably gold or silver that you feel works with the look you’re trying to achieve. A shimmery highlight would really make the brow bone prominent & would look great in pictures. Waterline: This is the area inside the eye where we apply kajal. To brighten your eyes use a white or creamy eyeliner (think Rekha – she does this all the time). To achieve a smokey eye, wear kajal in the waterline & smudge it just below to the lower lash line with a pencil brush. Lower Lash line: The bottom lash line is the lower portion of your eye where the lashes begin. Thicken the colour you place here for a smokey look. Inner corner of Lower Lash line: The tear duct area or the inner corner of the lower lash line is the place where you can apply a light shimmery eye shadow. What this does is that it attracts light and adds a lovely pop to the eyes making them appear larger. Great tip for women with small eyes.